Placed on the water, on the banks, or suspended in the air, lightweight, moist plant spheres present their round domes, bristling with a jumble of green. Here grow strawberry plants and lemon balm, a young willow and sedge grass : marshland species of aquatic plants, all the plants from the Hortillonnages have been reunited on these clods of earth. Designed by the Gama collective, this arrangement is inspired by a Japanese ikebana technique kusamono, which word for word means grass-object. 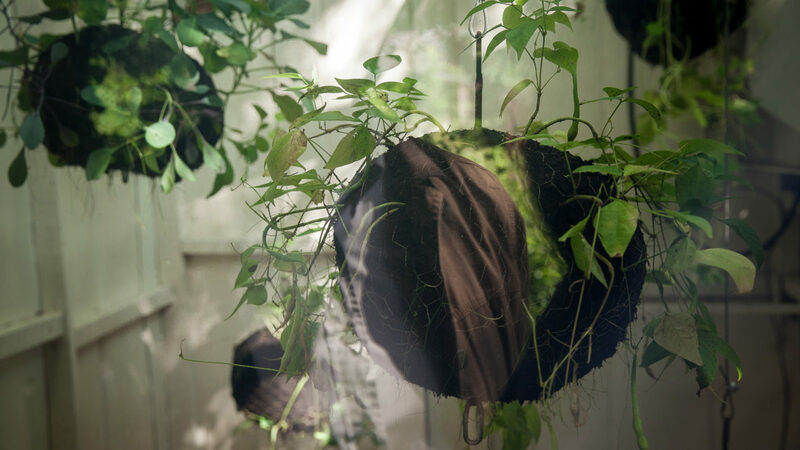 As floral compositions created from wild plants found in the forest, the vegetation is planted on a wide variety of media, and particularly on substrate domes covered in moss. Adapting this principle to the Hortillonnages, the Gama collective transfers the landscape from the water to the heart of the parcels of land and showcases the different faces of the Hortillonnages, a mixture of marshland and market gardening. Their « fragments » testify to the poetry of this vegetal world and its intrinsic ambiguity, a mixture of nature and artifice. The Gama collective is made up of two landscape engineers, Mélanie Gasté and Aurélien Albert, born respectively in 1986 and 1985. After studying applied arts on the one hand and plant technologies and landscaping on the second, their paths crossed at the Ecole nationale supérieure de la nature et du paysage de Blois, where their common interest in landscapes led them to work together. Their work is based on a desire to renew landscape projects, and the interweaving of complementary technical skills and sensitivities.